The gulf of Golfo Dulce in southern Costa Rica is one of the best places to see wild dolphins and migrating humpback whales, which you can do on a Golfo Dulce Dolphin Tour with Playa Nicuesa Rainforest Lodge. Dolphins, like whales, are regarded as some of Earth's most intelligent animals. They are highly sociable and live in groups called "pods" of a dozen or more individuals, although pod sizes vary greatly between species and locations. Dolphins communicate using a variety of vocalizations like clicks, squeaks, whistles, trills, grunts and creaking noises, in addition to nonverbal communication like touch and posturing. Its marine ecosystem is unique since the Golfo Dulce is one of only four tropical fjords in the world and is among the planet's deepest gulfs. More than 25 species of dolphins and whales, four kinds of sea turtles, tranquil and friendly whale sharks, rays, and a host of tropical fish can be found here. 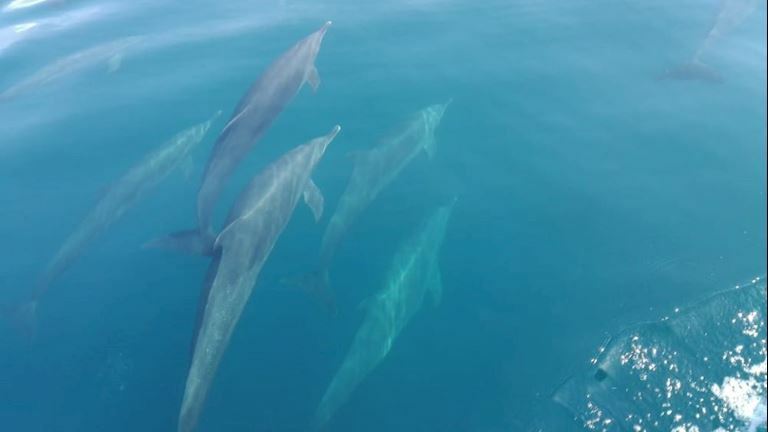 The Golfo Dulce Dolphin Tour with Nicuesa Lodge is an exciting way to experience Costa Rica's amazing marine life up close. Playa Nicuesa Rainforest Lodge offers a wonderful Golfo Dulce Dolphin Tour that lets you see dolphins and whales in their natural environment. Whale watching season is from late July to October. In one of the lodge's small boats, aided by one of Nicuesa's bilingual guides and your boat captain, you will spend several hours touring the gulf looking for dolphins, sea turtles and marine birds. During whale migration season, you'll also be on the lookout for humpback whale mothers and babies. During the tour, you will stop to snorkel at one of the reefs and/or a secluded beach, where you'll also take a break to enjoy some fresh coconut water and other snacks. Your guide will tell you about the natural and cultural history of the gulf and its marine life. You can commonly see three kinds of dolphins, and also humpback whales during migration season, in the gulf of Golfo Dulce. Coastal Pantropical Spotted Dolphins are found in shallow inshore waters and out in deeper ocean, although still close to shore. They have been seen to gather in huge "super pods" of up to 500 dolphins when food is plentiful.